This was my second time in this Hostel. And this time it was the same as the first time: a perfect stay. We recommend this hostel to everyone. Great and positive experience. This is the best hostel we've had on our interrail trip! Very clean, large kitchen and common room, nice rooms with good facilities. Supermarket, restaurants and metro station 2min walk! Perfect stay at Cat's Pajamas hostel! Me and my boyfriend had a private room with shower and toilet included. It was a beautiful room, it got cleaned everyday and it was very light because of the big windows and high ceilings. It was nice that there was an option for breakfast in the morning for only 5,50 euros, but it was also possible to use the kitchen with bought goods. 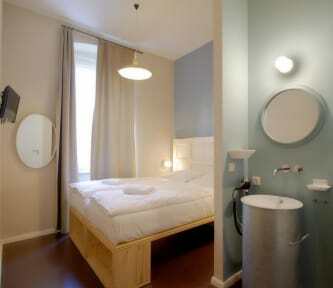 It is very close to the U- bahn 8 (metro) which takes you to almost every other part of the city. I would come back!! I really enjoyed my stay at this hostel! Despite some difficulties in the first night, the staff stayed friendly all the time and they solved the problem very well. The location is perfect. The busstop is basically in front of the building, the closest U-bahn hof is about 5 minutes away and the supermarket too. This hostel was our first hostel experience ever, so we didn’t really know what to expect but we were positively surprised. The beds were nice and the rooms were spacious (we stayed in a 8 bed female dorm). The kitchen was quite big and there were lots of places where your could sit and chill. Yea it’s not in the city center but the hostel is like two minutes from the u-bahn so it won’t take more than half an hour to be where you want to be. Great hostel & we would totally stay there again! Great place to stay and discover Berlin! The location is next to the U-bahn station. I didn’t really like the neighborhood, but it is a short ride to other places. The beds have individual lights and power, but the matrass was very thin. Bathroom was clean, but a bit small. Airconditioning was great. Overall it was a good stay but not excellent. Uitstekend hostel. Wel wat mis gegaan met de reservering wat zowel de fout was van ons, maar ook onduidelijkheid van het hostel. Het hostel heeft stapelbedden en gemengde kamers van 4 als je vervolgens een kamer boekt met twee bedden, kunnen daar ook maar twee personen slapen, het stapelbed valt dan weg. Houd daar rekening mee tijdens het reserveren. Voor de rest mooi hostel, goede faciliteiten, alleen veel stof op de bedden plankjes en douche ook niet even goed schoongemaakt. I stayed one night, but that was more than enough. First of all, the staff wasn’t really friendly or helpfull. Second, the batroom in the room wasn’t too clean. There were stains on the tiles on the wall, you saw they had been there for a while. The hostel is on a busy street, so there was noice all night, but I actually disn’t mind that. What I did mind was that there is a “silence from 23h rule” but there was a lot of noice in the hallways which the staff didn’t do anyrhing about.